Carolina Classic Trucks strives to deliver a wide selection of custom truck wheels for both classic and modern trucks. Aftermarket truck wheels provide a unique look and feel for your truck, giving your style a cutting edge above other drivers. We carry only quality, well-constructed pickup truck wheels and rims from trusted brands such as KMC, Mickey Thompson, and more. Simply scroll down to see a complete list of modern and classic truck wheels available on our website. Guaranteed lowest prices and friendly customer service. For fitment, availability and current pricing email us. 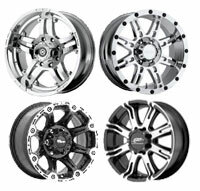 We carry custom wheels, chrome wheels, chrome rims, polished wheels, black powdercoated wheels, truck wheels, truck rims, off road wheels, and custom rims and wheel and tire packages for nearly every truck, SUV and car. To shop for wheels in our store, start by clicking any of the links below to choose a brand. From there, you can shop each brand's wheels by model. Complete information including wheel diameter, width, bolt pattern, backspacing, and offset are provided in an easy-to-read format to help you choose the right wheel for your truck. However, if you need assistance making your purchase, or if you don't see the custom wheels you are searching for, call or email us because we likely have them in stock or can get them for you. We also specialize in off road wheels for your Jeep or truck. If you're specifically looking for wheels for off-roading, please contact us and we'll be happy to help you understand your options. Some of our wheels are specially suited for off-road trucks. Use our custom wheel lookup to see wheels from one of our main distributors by clicking here, then email us the part number for a quote. Selection of new custom wheels can be simple or difficult depending on a few important factors, which we'll discuss below. But first and foremost, the desire to trick your truck out with new rims cannot go without the old adage - you get what you pay for. We're not suggesting that you have to spend tons of dollars to get quality, but the truth is that wheels can get pricey quickly, so outside of overall style that you are looking for there are a few other factors to consider. There are some factors that are specific to your vehicle type (e.g. bolt patterns, bolt circles, which wheel widths work best for your vehicle). The items below are in no particular order, but you should consider them all when deciding on a new wheel set. When considering performance as a facet of concern, you should first decide on what you need the wheel package for: racing, off-roading, or simple aesthetics. The type of performance need you are addressing will often dictate which type of wheels you are looking for. Aluminum wheels are extremely light, while being very durable. Steel wheels will take a pounding and come back for more. Additionally, from a performance viewpoint, you may want to consider whether your vehicle has and supports a Tire Pressure Monitoring System (TPMS). Many newer vehicles have TPMS integrated and certain wheel types and manufacturers may not support TPMS. Ultimately, the ride quality that a wheel can provide is a likely factor for you to consider in the performance area. Bigger wheels may adversely affect your ride quality, so as previously stated, pick the right wheel for the right type of driving you intend on doing. Smooth roads will not likely provide a decrease in ride quality, but potholes and rough gravel roads can quickly become more noticeable with the wrong type of wheels. Bolt Patterns are pretty straight-forward, as there are only four standard varieties: 4-lug, 5-lug, 6-lug and 8-lug patterns. You can check your bolt pattern by simply taking a look at your current wheels to see what you have. Unless you are swapping out your axles, or are planning on using some type of wheel spacers/adapters, you'll need to buy custom wheels with the same bolt pattern as the wheels currently on your vehicle. The bolt circle is the other factor to consider, when assessing your wheel options. The bolt circle diameter (BCD) and the pitch circle diameter (PCD) are the two measurements to focus on. Measurements for BCD and PCDs are represented in milimeters. Keep this in mind, because this is not a place where a square peg can fit in a round hole. Moreover, if you are having wheels shipped, the costs can get pricey based on weight and the speed with which you want to receive the new wheels, so it's more cost-effective to get it right the first time. To measure your bolt circle, first count your lugs to see if you have a 4-lug, 5-lug, 6-lug, or 8-lug pattern. For 4-lug, 6-lug, and 8-lug wheels, the measurement is simple - measure from the center of one lug nut, straight across the center of the wheel, to the center of the opposite lug nut. The 5-lug wheel is a bit trickier; measure from the outside edge of one lug nut, to the center of the lug nut that is 2 places away from the one where you started. The diagram below shows these measurements for each pattern. 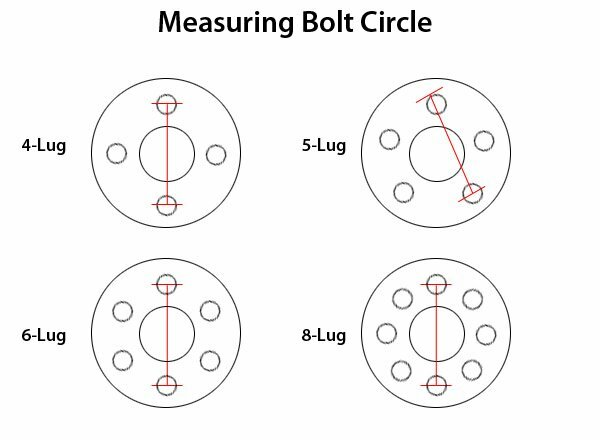 Getting an exact measurement with only a tape measure or ruler is unlikely, so some common bolt circle measurements are shown below. The diameter of the wheel or profile is a consideration as you seek to determine which wheel sets are going to work best for you. Performance issues, wheel well spacing and the turn radius of your vehicle will all go into the calculation of which wheel offerings make the most sense for you. Again, it all comes down to what you want to do with your custom wheel set, but don't forget to consider the tire profiles, as a low profile tire allows you to have a larger rim. The offset is the distance between the center of the wheel to the hub (or wheel mounting surface). Wheels with incorrect offset can stick out past the fender, or even be too far in, resulting in rubbing when turning. This is a cardinal no-no for truck enthusiasts; nothing crimps your style faster than putting those new rims and tires on and hearing that rub in the first turn. Eating up your wheel wells or cutting a tire down can become an expensive habit that no one wants to get into. 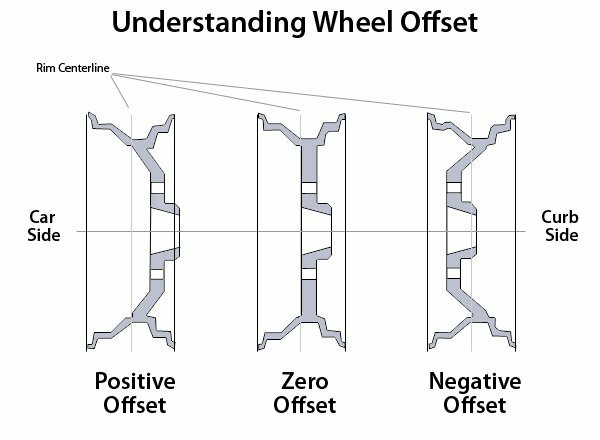 The following diagram will help you understand your wheel offset. A positive-offset wheel sticks out further, while a negative-offset wheel is set further in. The weight of the wheel itself affects your car's ability to provide adequate braking, and also affects the overall vehicle suspension and ride quality. Heavier wheels increase braking distance, make it more difficult to handle the vehicle and can cause excessive wear and tear on your suspension. New rims are great, until they start costing you money everywhere else in your suspension; then they start looking like a shiny money pit that wasn't worth the frustration. If you're going for bigger wheels, just keep in mind that a 5-6 lb increase per wheel is not likely to break your bank (or suspension), but again it comes down to what you are trying to accomplish. In the end, buying a new set of rims is not a simple task. It'd be easy to just say, "I like those over there so let's get them," but we hopefully have outlined at least a few of the considerations you want to take into account when making these purchases. We've outlined a few of the most important ones here. If you have further questions our sales team is happy to help if you call us at 1-336-298-4168. If you don't see the Truck Wheels you are searching for, call or email us, chances are we have it in stock. Guaranteed lowest prices and friendly customer service.